Open your web browser (Internet Explorer recommended). Click on the Briefcase for your school (see links above) and a 2nd window will open. Click "OK" if a security alert window appears. Enter InstructorID (your Staff ID number), no dashes or spaces. This is an application allowing faculty and staff to create and view custom ad hoc enrollment reports online. These reports are built on data which is being drawn every 20 minutes from our colleges' databases. Currently you can submit from 4am to 10pm (Pacific Time Zone), seven days a week. Please note that your grade submission work must be submitted by 10pm or all work will be lost! Don't wait until the last minute to submit grades at the end of the quarter, as the server can be overwhelmed. If you have never been assigned a password, or have forgotten yours, contact Melissa.Stoner@seattlecolleges.edu in Payroll and Benefits: 206 934-4124. Your PIN is generally your SSN, unless you have changed it. Also, you use the same PIN and PW to access and review your Employee Earnings and Benefits online. It is true the certificate on the old District Server has expired. 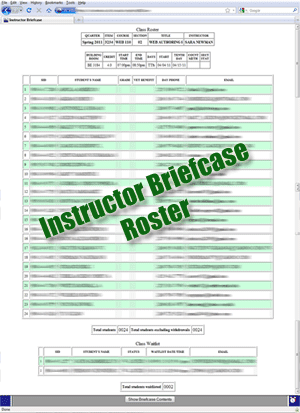 We have removed the Instructor Briefcase application from the computer and have replaced it with an auto forward page. If you use the old link, you will get the security warning, but you will not be passing data over this server. The server is there only to forward you to the new address. The new server is using 128-bit encryption to insure the secure transfer of data. Technically you can, but we are trying to discourage you from doing so. The IBC portal page is where we will post important bulletins you need to know about. In addition, if we ever need to move the application for security reasons, that move will be transparent to you. When your class roster first opens, you may notice that the print icon is disabled. So is the print command in the file menu. Click anywhere on the roster. This will bring the frame "in focus" and you will note the icon and menu will both now be enabled and you should be able to print from either the Icon or the file menu. Enter new PIN (6 characters is best - numbers only).